Vin Diesel’s charisma may not be enough to save a movie that is this pedestrian. A rough script is one thing–I mean, Diesel has been known to take a couple–but at it’s best it’s just a stylistic exposition with too many rules built into the film universe. 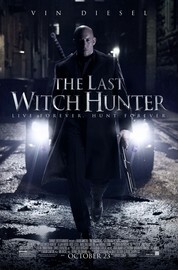 Full of plot holes and convoluted details is The Last Witch Hunter, a tale about a man (Diesel) cursed with immortality by a witch in the middle ages, only to ward off the same evil 800 years later in New York City. I applaud the film for a couple of clever plot twists that keep the audience involved and attentive, but I constantly feel like I’m playing catchup with everything else. It will give us a motif or a totem to remember early on and then refer to it much later, after not mentioning it in between, assuming that we remember its significance. More or less, the plot is simple enough to follow. But the confusing details surrounding the events feel included to stretch out the premise. The Last Witch Hunter is attractive stylistically as it utilizes some cool props and spells, but the use of CGI–albeit few and far between–reminds us that we’re watching a movie. The film tries creating depth for our lead character by showing us flashbacks of his wife and child. But the only thing is they serve no purpose to the story–literally. It’s forced and keeps the movie untrue to itself, reminding us even more how little depth he has. We really just want to see Diesel go around hunting witches–as the title describes. Another sign of forced-depth is the use of trite dialogue that merely sounds good in the moment, while having no real meaning or relevance to the premise. The Last Witch Hunter isn’t a boring movie at all–perhaps is strongest trait–but after it’s finished we long for a better understanding of what we just watched.